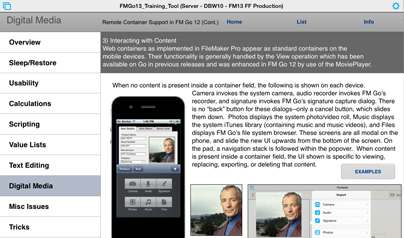 The FileMaker 16 for Mobile Devices Training Course benefits from several "hands-on tools"…and this is one of them. Of course, while this tool is handy, it is much better while watching the training videos. 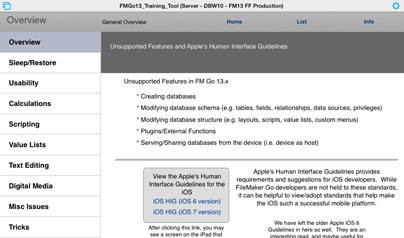 The FileMaker 16 for Mobile Devices Training Course is a must-have training app for anyone building mobile solutions with FileMaker Go 16. With over 7 hours of video content streamed directly to you – this video course will immerse you in this new powerful application, and bring you up to speed fast! Richard Carlton, walks the viewer through a wide range of topics including "UI Considerations", "Bar Code Capture", and "Device Rotation Capture", to more complex subjects such as "Base64 Encoding for Off Device Backups". 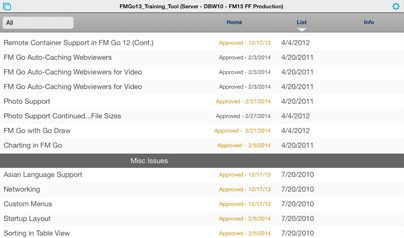 Whether you are new to the FileMaker platform or are an established FileMaker developer, download the FileMaker 14 for Mobile Devices Video Training Course today and become a mobile ninja. Learn what you need to start building your own mobile application for in-house solutions, or your own commercial mobile app. Content is streamed onto your dveice and requires an Internet connection. Richard Carlton is the CEO, and a Senior Engineer at Richard Carlton Consulting Inc. and its subsidiaries. Richard has been involved with the FileMaker platform since 1990 and has grown RCC into one of the largest top tier FileMaker consultancies worldwide. Richard works closely with RCC’s staff: a team of 28 FileMaker developers and supporting web designers. He has offices in California, Nevada, and Texas. Richard has been a frequent speaker at the FileMaker Developers Conference on a variety of topics involving mobile application development, and client server integration. Richard has previously worked with VTC as a Video Training Author, and then later, started a new video publishing company, dedicated to the needs of the FileMaker community. 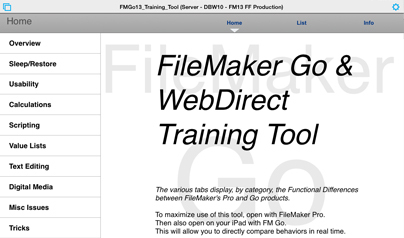 LearningFileMaker.com is a new startup, and is dedicated to the FileMaker Platform, with hundreds of videos and upwards of 50 hours of recorded content available for free, or for purchase. Richard won 2015 Excellence Award from FileMaker Inc (Apple Inc) for outstanding video and product creation, leading to business development. RCC and LearningFileMaker.com are headquartered in Santa Clara, CA.